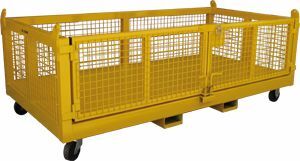 National Sales double pallet Goods cage is engineered and designed in accordance with AS4991. This universal crane goods cage can be transported using crane, forklifts or pushed manually. It features two swing gates, allowing internal clear access for two standard pallets. The double pallet goods cage has 4 x certified lifting points fully welded into the frame.